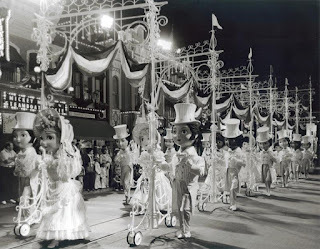 It’s been mentioned in some of the other pieces, but a large part of the America on Parade bicentennial celebration was the individual attention given to each state for a week during the year. While the main event lasted for fifteen months, this aspect only ran from July 6, 1975 through June 26, 1976. If you’re running the math and that looks like an odd 51 weeks, you’re right! The first week opened with the honoring of Washington, D.C. It may not seem like much, but when was the last time you saw a theme park focusing on a state other than the one where the park is located. I don’t know that it drove tourism rates up for the spotlighted states during their America on Parade week, but that’s not really the point. The fact of the matter is, Disney did something to above and beyond to make guests and guest entertainers feel unique and special.